Suo padre, Ned Bundy, Diceva che ogni conchiglia, quando viene tirata fuori dall’acqua, trascina via con sé anche il rumore del mare che sta lasciando. Basta una piccola goccia al suo interno e la conchiglia continuerà a raccontare di quel mare per sempre. Nella collezione di Ned Bundy c’erano conchiglie con dentro il rumore delle onde della battaglia di Trafalgar, o il mare calmo di quando Colombo arrivò in America, o ancora i flutti battuti dalla pioggia del Diluvio Universale. Ogni giorno del mondo aveva il suo mare, e ogni giorno del mare la sua conchiglia, e ogni conchiglia, dentro, aveva la sua storia. A patto di saperla ascoltare. Ned Bundy le ascoltava, le catalogava, le sistemava secondo una logica tutta sua. Ma quello che ogni sera cercava sulla battigia di fronte casa, era il rumore del mare di una notte che avrebbe voluto rivivere per sempre. Una notte di tanto tempo fa il cui rumore, di certo, era rimasto incastrato in una conchiglia che prima o poi avrebbe trovato. Vinpeel lo seguiva ogni volta che poteva, attento a non disturbarlo, fino a quando suo padre, con le tasche piene, non si riavviava dentro casa. «Ancora un altro poco» rispondeva Vinpeel. Ned Bundy, a quel punto, sorrideva senza dire niente e Vinpeel faceva altrettanto. C’era sempre un certo imbarazzo tra loro. Quello che hanno gli uomini quando non sanno come sfiorarsi. Una volta rimasto solo, Vinpeel continuava a cercare conchiglie. Cercava quelle che per colore, grandezza o forma, avrebbero potuto incuriosire il padre. Le raccoglieva e ci parlava dentro. E diceva le cose che avrebbe voluto dirgli perché, diamine, se al mare basta una goccia per riempire una conchiglia con la sua storia, allora a lui bastava soffiarci dentro anche solo una parola, una piccolissima parola. E se Ned Bundy avesse raccolto proprio quella conchiglia, o una qualunque di quelle in cui aveva parlato ogni sera, allora sì che sarebbe finalmente arrivato il tempo per trovarsi. Senza imbarazzo. O paura. Vinpeel raccolse la conchiglia più grande, se la portò alle labbra e, come ogni sera, parlò a suo padre. Parlò di piccole cose, delle sue scoperte, della sua giornata. Una volta finito, avrebbe appoggiato la conchiglia sulla battigia, e la sera dopo avrebbe accompagnato suo padre seguendolo passo dopo passo, nella speranza che si chinasse a prendere proprio quella lì. His father, Ned Bundy, used to say that every shell, when removed from the water, carried within it the sound of the sea it was departing. Just a tiny drop of water inside, and the shell would continue to tell the tales of that sea forever. There were, in Ned Bundy’s collection, shells with the sound of the waves at the Battle of Trafalgar, or the quiet sea at Columbus’s arrival in America, or even the thrashing tides of the Great Flood. Every day of the world had its own sea, and every day of the sea its own shell, and every shell its own story inside it. If you knew how to listen. Ned Bundy listened, catalogued, organised everything according to his own logic. But what he looked for every night on the beach in front of his house, was the sound of a night that he would have liked to relive forever. A night from a distant past whose sound, certainly, was trapped inside a shell that he would one day find. Vinpeel followed him any time he could, careful not to disturb him, until his father, pockets brimming with shells, turned to go back home. “In a bit” answered Vinpeel. At that point, Ned Bundy would smile, and so would Vinpeel. But neither said a word. There was always a bit of awkwardness between them. The kind that men feel when they are incapable of touching each other. Once he was alone on the beach, Vinpeel would continue to search for seashells. He would choose big, oddly shaped, bold coloured ones that would catch his father’s eye. He would pick them up and speak into them. And he would say the things he would have liked to tell his father because, hell, if all it took was a drop of seawater to fill a shell with a story, well, then, all it would take was for him to whisper a single word into the shell, a single, tiny word. And if Ned Bundy were to pick up that very shell, well, then the time would finally come for them to find each other. Without the awkwardness. Or the fear. Vinpeel picked up the biggest shell he could find, brought it to his lips and, like he did every night, spoke to his father. He talked about the little things, his discoveries, and his day. Once he was finished, he would place the shells back on the sand. The next night he would trail behind his father, just one step behind him, in the hope that his father would pick up his shell. Peppe Millanta is not Peppe Millanta’s real name. It is a pseudonym, a mask to hide his revolutionary activity during his school years at the University of Rome. Student by day, vagabond by night, he is known to say that he has had the shortest career as a lawyer known to man: a mere 12 hours. A street musician, he also gained a degree in Drama and Screenwriting from the Accademia Nazionale Silvio d’Amico. He is the winner of numerous writing and theatre prizes. 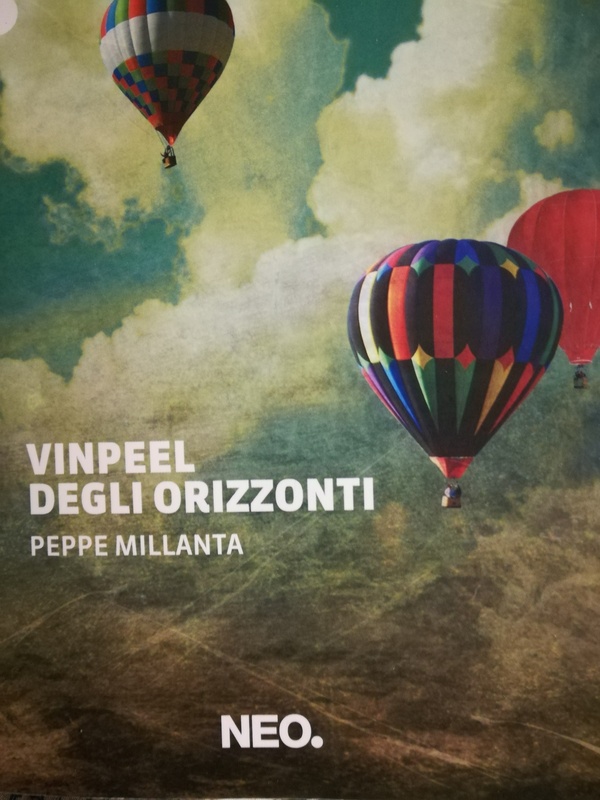 Vinpeel degli orizzonti (Vinpeel of the horizons) is his first novel, and the winner of the following prizes: “John Fante – Opera Prima” 2018; “Alda Merini” 2018; “Augusta” 2018; “Quercia in favola” 2018; “La Pania” 2018; “Bovio” 2018; “Borgo Albori” 2018; and just recently the “Premio Thesaurus” for author of the year. The novel also placed second in the “Nero su bianco” prize, 2018; was a finalist in the “Carlo Piaggia” prize, 2018; received special mention in Premio Città di Grottammare 2018; and was longlisted in the Premio Strega – ragazze e ragazzi 2018. I would like to thank the author and Neo Edizioni for their kind permission to publish the excerpt in translation.